This make-ahead Cranberry Cheddar Cheese Ball is a festive addition to the holiday season. Our family is lucky to relax at home on Thanksgiving rather than shuffling from house to house like many do. Our friends and family always arrive in time for kick-off of the first football game. The day is spent munching on appetizers and cheering on our favorite teams while working up an appetite for the big turkey dinner. This year we are kicking off the day’s festivities in style with these Cranberry Cheddar Cheese Balls. Filled with our favorite Kerrygold Aged Cheddar Cheese, cream cheese, dried cranberries and crunchy pecans, this show-stopping snack is always a hit. But don’t worry, the recipe only has a handful of ingredients and comes together in minutes so it’s easy to pull together. This recipe for Cranberry Cheddar Cheese Balls is also freezer-friendly. 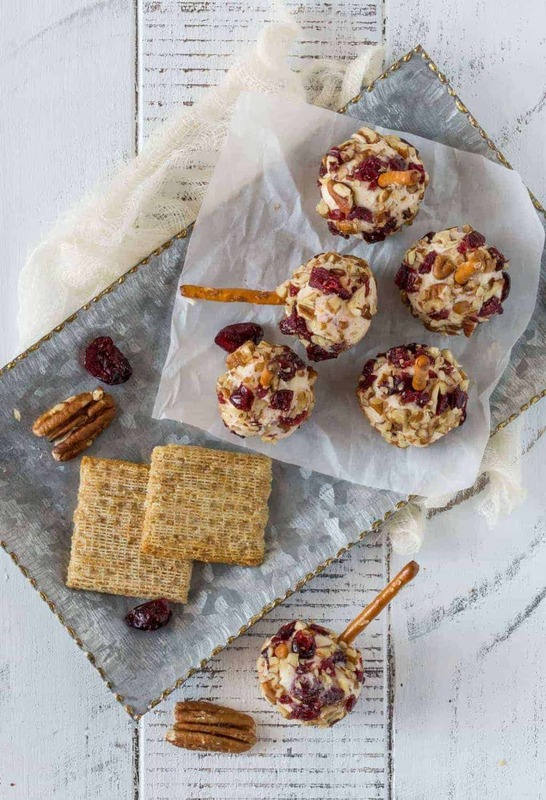 I’m a huge fan of make-ahead recipes and these Cranberry Cheddar Cheese Balls are already in my freezer ready to go for the big day. How’s that for planning ahead? Tip: If you happen to have any leftover cheese ball, you can simply reshape it and serve it again at a later date. Have a little extra time? Use a cookie scoop to portion the cheese mixture and make these adorable mini cheese balls. Don’t want to fuss with it? Make one large cheese Ball and let people dig in. 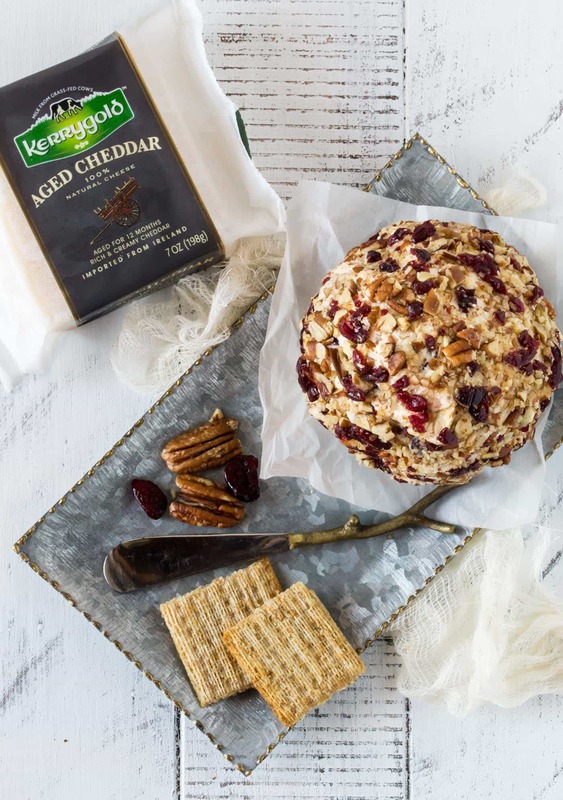 However you serve them, this recipe for a Cranberry Cheddar Cheese Ball is sure to be a hit. Place the cream cheese and cheddar cheese in the bowl of a food processor. Blend until mixture is smooth. Stir in 1/3 cup finely chopped dried cranberries. Scoop mixture onto large piece of plastic wrap and form into a ball. Chill until ready to serve. Remove cheese ball from plastic wrap and roll in chopped pecans and remaining 1/3 cup of chopped dried cranberries. If you freeze the cheeseball – how long does it need to defrost? I usually pull it out of the freezer the night before or the morning I want to serve and defrost it in the refrigerator. Otherwise, you can let it sit on the counter for a few hours and it will be good to go. Enjoy!